Today I would like to talk about eating in season. Wherever your living nature supply’s us with the nutrients we need from what is available to eat in that season. We are still in winter here in the South West and so we have fruits like Tamarillos(tree tomatoes) mandarins and tangerines that are all high in Vit C to help fight off the winter colds. It is also a time where root vegetables also grow well. With the winter cold we always feel like eating warming foods. So its a good time to make soups that will help us keep warm. 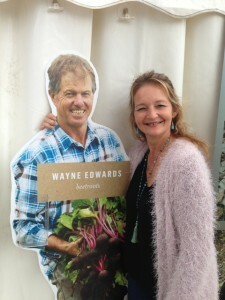 This photo is Wayne my husband as a card board cut out. The Southern Forrest food council are doing promotions of the area and I just love this. Hoping I can have him when they are finished with it so it can keep me company when hes away lol. Hes holding some Organic Beetroots that we grow. Lots of people are not sure of how to eat them. We love to drink them, but also put them salads grated and raw. Did you know if you eat or drink beets and then your stools are purple its a good indication that your HDA (hydrochloric Acid)are low. You need these to be strong so you can digest minerals and vitamins from the greens that you eat. With cooking them this is the nicest way I have found to eat it. Cut up into quarters 3 beetroots. 1Tbs Cold pressed olive oil or coconut oil. Cook in oven for about 1 1/2 hours serve and enjoy! This entry was posted in Kitchen and tagged Eating in Season. Bookmark the permalink.